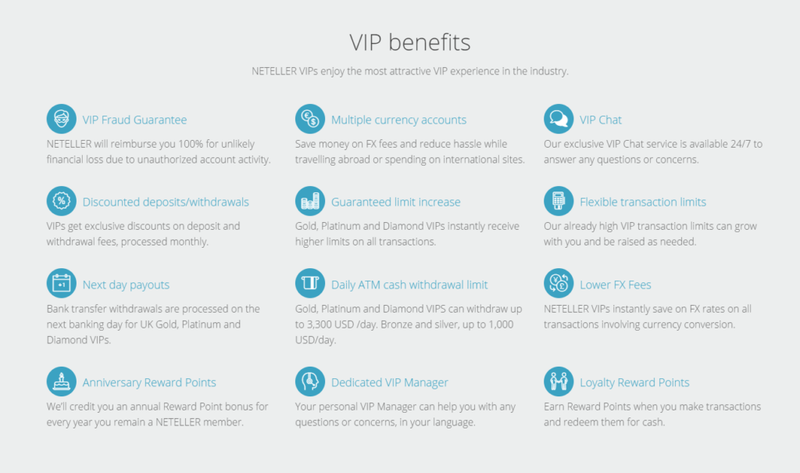 NETELLER offers their NETELLER VIP Program to reward its most active account holders for using their services. The VIP Program and status is calculated upon the transaction activity of the account. By reaching the respective NETELLER VIP levels, the account is eligible for various benefits including (but not limited to): VIP Fraud Guarantee, Multiple Currency Accounts, a dedicated VIP manager, limit increases, higher cash ATM withdrawal limits or even cashback for the highest two limits. See a full list of benefits below. You can see your current NETELLER VIP level at the top of the left-handed NETELLER menu. eWallet-Optimizer clients enjoy an instant VIP upgrade to Silver VIP level right after their verification. If you are no silver VIP yet, just submit your account details and let us check if we can get you upgraded. The eWallet VIP levels are determined on a yearly basis. 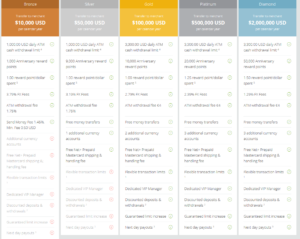 There are five VIP levels that will automatically be set in the account once the transaction goals are hit. Once you have reached the required transfer volume for the next VIP level, your account will be upgraded automatically within 24h. $10,000Transfer 10,000 USD to merchants per calendar year. $50,000Transfer 50,000 USD to merchants per calendar year. $100,000Transfer 100,000 USD to merchants per calendar year. $500,000Transfer 500,000 USD to merchants per calendar year. $2,000,000Transfer 2,000,000 USD to merchants per calendar year. By reaching higher VIP Levels, you will benefit of higher Transfer limits and lower FX currency fees. You will also be able to use up to the NETELLER Virtual PrePaid Card and you can order a physical NETELLER NET+ MasterCard for all your different currency accounts. All eWO clients will be upgrade to Silver VIP level instantly after their verification and can enjoy all benefits of the Silver VIP level. In addition you will also have increased transaction limits and you can use our personalized support. Make sure to submit your account details to not miss any of our benefits. As a NETELLER Platinum VIP you earn 0.25% cashback from NETELLER directly, while NETELLER Diamond VIPs earn 0.5% cashback on all transfers to merchants. 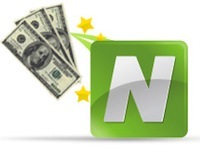 NETELLER also runs promotions frequently. Most of them are prize promotions where you can win prizes using your NETELLER account. Please note, the cashback will be paid in addition to our cashback and all other benefits like the reward points. All VIP clients also collect reward points for EVERY transfer. Each USD you move in or out will earn you 1 point. 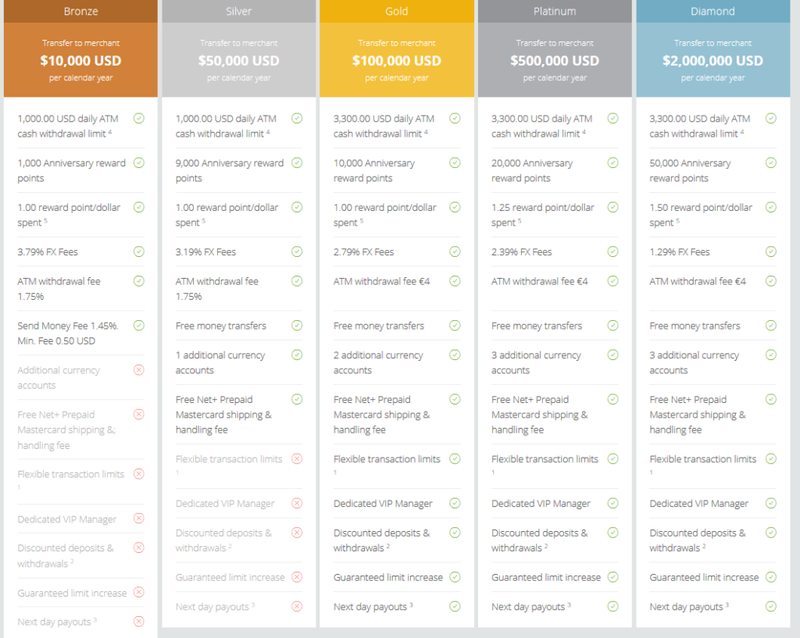 Platinum VIPs earn 1.25 points per USD and Diamond VIPs earn 1.5 points per USD moved. Those points can be redeemed for cash, merchandise or digital gift cards in the VIP Point Shop. NETELLER Bronze VIP – 1,000 Anniversary Reward Points. 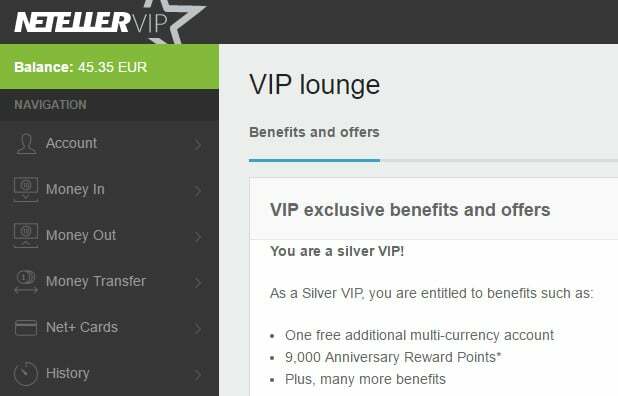 NETELLER Silver VIP – 9,000 Anniversary Reward Points. NETELLER Gold VIP – 10,000 Anniversary Reward Points. NETELLER Platinum VIP – 20,000 Anniversary Reward Points. NETELLER Diamond VIP – 50,000 Anniversary Reward Points. Please make sure to be enrolled in the NETELLER Reward Point program to collect reward points and to get the Anniversary points. NETELLER VIPs enjoy a lot of benefits and can earn huge value for their transfers. 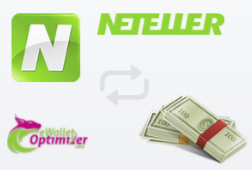 In combination with our free eWO NETELLER Bonus program NETELLER becomes one of the best places to keep your funds and earn money for just moving your funds. If you are interested in joining NETELLER and want to become NETELLER SILVER VIP member right after account verification, please proceed with our registration or contact us for any further questions.